To say it was a Party is an understatement. D-man's little munchkin friends all started arriving at 10:30, and we had a house full of star wars characters. They were light sabering each other all morning, and you should have seen D-man's face…his smile went from ear to ear as he was in his own little world. 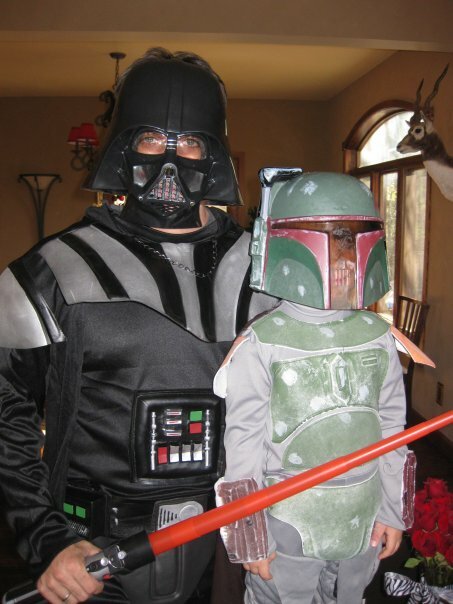 All goes to show you, even if it means dressing up like the classic villain Darth Vader, there's nothing that can match getting into your child's life for a little while. Sometimes we make it so hard. We think raising kids is all about being the "adult" and showing them "maturity." When sometimes all they need to see is a little vulnerability to be real. They want to know we care about the things they care about. After all, isn't that what relationships are all about? If we spent more time worrying about the needs of those around us, and less time worrying about what we need to do, or get out of a relationship; I think the world might spin a different direction. We had a lot of fun yesterday just playing with the neighborhood kids, and it re-enforced the need to make sure we're giving ourselves away to people, and hopefully we build a foundation of relationship that will last a lifetime.